These clips were taken in Kew Gardens, in London, England. Look carefully to see yellow pollen stuck to their bodies. This is a speeded-up video. To see baby birds, scroll down and click on the video play button, or to listen to birds, click on the audio button. To see more birds, click on a bird in the menu on the left. Click on a butterfly, a dandelion, a cherry tree or a different living thing. Click on a type of animal then click on a photo to see a bigger picture. Scroll to the bottom of the webpage and click on a season. Choose activities by age, activity type and season. What is a tadpole? Why do flowers need bees? Who lives under the sea? 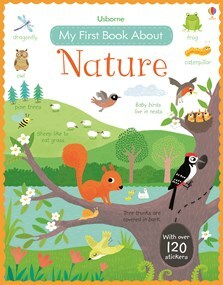 This charming introduction to nature includes over 100 stickers for young children to add to the pages as they learn about the seasons and different kinds of animals and food chains and match animals to their tracks, make a simple nature table and find treasures on a beach. Includes internet links to age-appropriate websites. Also available as a hardback library edition with no stickers and with a contents page and index.